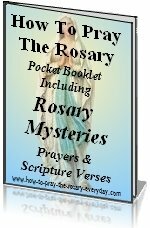 This website is dedicated to The Blessed Virgin Mary and is under the protection of our Patron Saint Joseph. 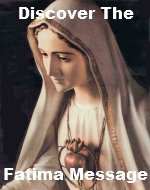 The goal of this site is to familiarize you with the lives of Jesus and Mary. And it seems appropriate that Saint Joseph watch over it just as he watched over the lives of Jesus and Mary while they were on earth. The Angel Gabriel appeared to St. Joseph in a dream and told him that Mary was to be the mother of God. 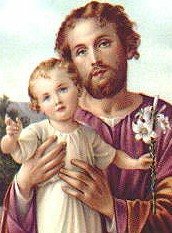 St. Joseph was a good and just man, and when he found out Mary was pregnant he was going to divorce her quietly out of compassion towards her. They were betrothed which in their culture was legally binding. He didn't know that she had conceived of the Holy Spirit until the angel told him. Joseph and Mary were married. He provided for and protected Mary. He was the Blessed Virgin Mary's most chaste spouse. Mary had made a vow of chastity and promised to always remain a virgin. St. Joseph lived by this vow as well even after Jesus was born. He was honored just to be a part of this special, this Holy Family. Joseph led Mary to Bethlehem where Jesus was born. You often see this journey depicted in art with Mary on a donkey being led by St. Joseph. This is a beautiful image that shows the selfless devotion Good St. Joseph had for Mary. In Bethlehem St. Joseph was rewarded for his faithfulness by being the first man to worship the Divine Child, Jesus. Joseph named Jesus just as the Angel instructed him to do during the first dream. "Thou shalt call his name JESUS. This also emphasizes Joseph's role as foster father and head of the Holy Family. Joseph was told what to name Him. ...God wanted him to play an active role in this family. For this is how God ordained that a family should be structured. Joseph took Mary and Jesus to the Temple in Jerusalem where they offered two turtle doves. Joseph was warm and inviting when the three Wise men came to worship the baby Jesus. An angel again appeared to Joseph and told him to take Mary and Jesus to Egypt where they would be safe from Herod's cruel jealousy towards the Christ Child. Once again, our Patron Saint Joseph took care of the Holy Family, as in our hopes he will help take care of this website. The angel again delivered a message to Joseph telling him that it was now safe to take the Holy Family back to Nazareth. There Jesus grew in holiness. After seeking with Mary for three days, Joseph found the twelve year old Jesus where he was conversing with the teachers. Joseph taught Jesus in his trade as a carpenter. Joseph died a happy death in the arms of Jesus and Mary. Joseph always trusted God for he never doubted or questioned the will of God. He always confidently did as the angel instructed him. I place in thee all my interests and desires. homage to the most loving of Fathers. and Jesus asleep in thy arms. I dare not approach while He reposes near thy heart. We pray that our Patron Saint Joseph helps us deliver to you the life of Jesus and Mary the way God would want it presented.